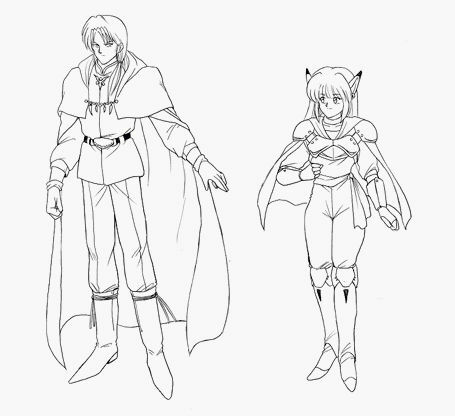 In these sketches, we see some alternate character designs for Rune and Rika. Rune's alternative design is very similar to his final form, but there are a few changes. His sleeves are a bit longer here and he wears a different style of boot. Rika's outfit is the really interesting one here. According to Phantasy Star: Official Production Compendium, this was her winter gear, to be used on Dezoris instead of her typical leotard outfit. Many video games have characters wearing the exact same clothes in arctic and desert environments. Phantasy Star IV is no exception, but this is at least proof that the developers thought about giving Rika a more sensible outfit for the blizzard conditions of the ice planet. Unfortunately the outfit was not used in the game because it did not match up with her battle sprites. You may view the gallery page for Alternate Designs. Chaz: Holy... Rika, are you actually wearing armor?! Rune: Take it off, Rika. It's not that cold, and the artists don't feel like drawing new combat sprites. Rune: (grumbling to Chaz) That's TWO you owe me, Shorty. Different designs for Rune and Rika? Which do you like best? For me, the best design is...a tie ! lol hard to tell wich one is the best but both are gret pieces of art !